There are over 1,500 refugees sleeping rough on the streets of Paris. 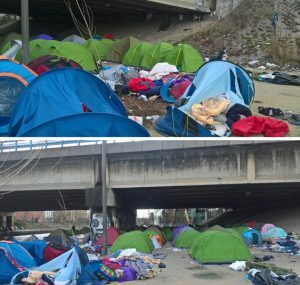 The reasons are different to Calais; whereas many people along the Northern coast of France are hoping to get to the UK, in Paris there are many refugees who are hoping to claim asylum in France. However, they may not have been able to enter the system because it is swamped, they may be in the process of claiming asylum but are destitute because they are not allowed to work, or they may have been rejected due to failures in the ‘Dublin’ system. Care4Calais sends volunteers and aid to Paris on a regular basis. Images of people sleeping rough on the streets of Paris, under bridges and in slums are often seen and we are glad to support them in a cohesive way. Our volunteers often travel for an overnight stay, meeting with our partners and helping with a distribution in the evening whilst there. This is a very worthwhile experience that allows you to see another aspect of the refugee crisis in northern France.